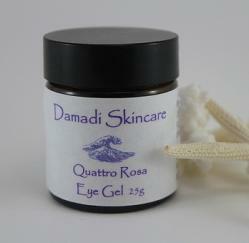 Quattro Rosa Eye Gel is a lusciously light weight non-greasy eye gel. It can be used all over the eye area and assists with softening the fine lines around the eyes and reducing puffiness. With a large portion of Organic Rosehip oil, it’s naturally high in healing Vitamin C and which can help fight free radical damage and slow the signs of aging. Other key ingredients are Pure Rose essential oil an ally in the fight against wrinkles, puffiness and broken capillaries, Rosewood oil, Palmarosa oil, Jojoba and organic Aloe Vera for tightening and firming the skin. With all those roses it’s easy to see where the name came from. Application– apply gently around the upper and lower eye contour, taking care not to get too close to the lash line. 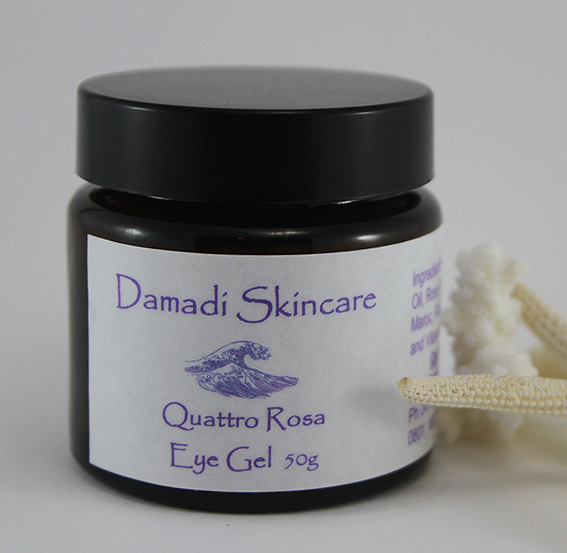 Many Damadi customers use the Quattro Rosa Eye Gel all over their face and at their request the Eye Gel is also available in a 50g jar. Tip– While this gel is made for the eye contours, you don’t have to limit yourself to just that areas.This cream is designed to help the skin regenerate, so it may assist with scarring and damaged skin. It is also recommended that smokers apply the Quattro Rosa Eye Gel around their lips to help prevent lip feathering lines. Although it is our deepest hope that smokers will quit, as it's the fastest way to age your skin. Tip– Trouble sleeping? In Aromatherapy, pure Rose oil is a central nervous system relaxant. So if you can’t get to sleep, rub a little Quattro Rosa Eye Gel on your temples and the back of your neck and drift off with the beautiful smell of Roses. My Fav Damadi product, goes on so smoothly, minimal rub in required,smells beautiful & fresh, does the job! Use it for entire face, a beautiful product.